This privacy notice provides you with details of how we collect and process your personal data through your use of our site www.missbespokepapercuts.com including any information you may provide through our site when you purchase a product or service, sign up to our newsletter or take part in a prize draw or competition. Aimee Louise Richards is the data controller and we are responsible for your personal data (referred to as “we”, “us” or “our” in this privacy notice). order our products or services, create an account on our site, subscribe to our service or publications, request resources or marketing be sent to you, enter a competition, prize draw, promotion or survey; or give us feedback. Contact, Financial and Transaction Data from providers of technical, payment and delivery services such as: Braintree and Paypal, both based in the USA. My store is hosted on Shopwired. They provide me with an online e-commerce platform that allows me to sell my products and services to you. Your data is stored through Shopwired's data storage, databases and the general Shopwired application. They store your data on a secure server behind a firewall. We may process your personal data for more than one lawful ground, depending on the specific purpose for which we are using your data. 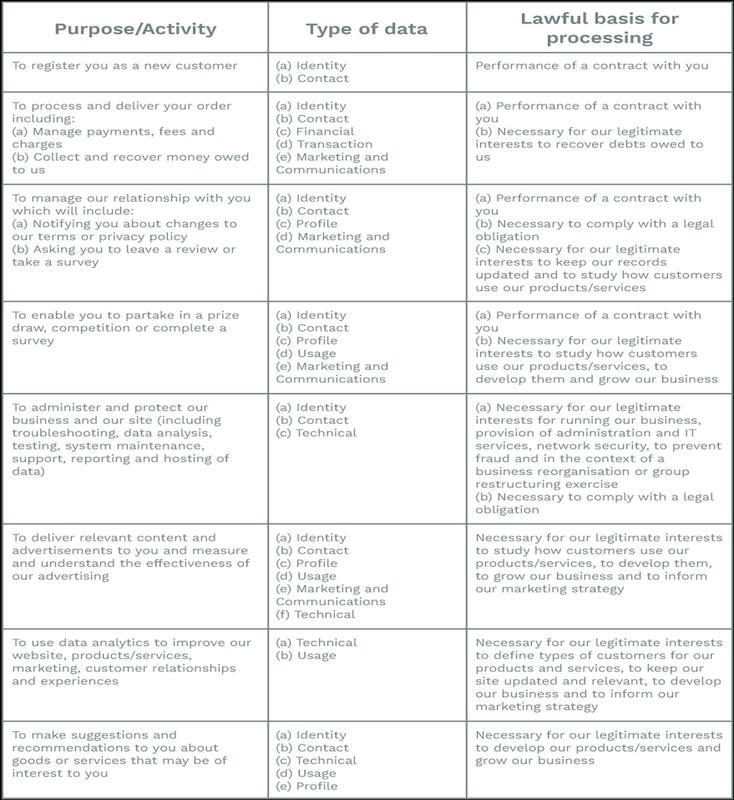 Please email us at aimeemissbespoke@gmail.com if you need details about the specific legal ground we are relying on to process your personal data where more than one ground has been set out in the table below. You can ask us or third parties to stop sending you marketing messages at any time by following the opt-out links on any marketing message sent to you or OR by emailing us at aimeemissbespoke@gmail.com at any time. Please email us at aimeemissbespoke@gmail.com if you want further information on the specific mechanism used by us when transferring your personal data out of the EEA.